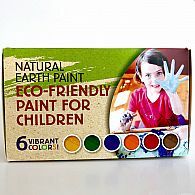 From the manufacturer: Natural Earth Paint was founded in 2011 by professional artist, mom and environmentalist, Leah Fanning. Leah had been searching for truly non-toxic, yet very high quality art supplies for years and finally decided to create the products that she desired. After realizing that this way of painting created much HIGHER quality supplies than the synthetic, toxic counterparts, she was on a mission to spread the word to artists everywhere.